Mobikwik is come with new a new offer. You will win a car from recharging from Mobikwik..
Or if u installed already skip this step. 6.You will Be Entered In this Contest Now. 7.You can do this 10 times per user. 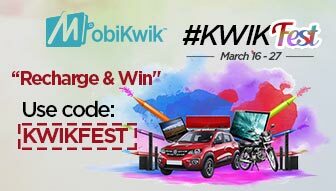 6.KWIKFEST is an Apply only Code. The user will receive *Coupon Applied Successfully* message which only means that the user is successfully registered for the campaign. 7.A user can use the code a maximum of 10 times daily during the offer period. 13.MobiKwik reserves the right to end any or all offers at it’s sole discretion without any prior notice.